CJ and Walter Reed have been recruited by the Special Agent in charge of the elite Nightshade Group to become agents. The only drawback is that they must both pass the training at Quantico as partners. Training begins and some how they manage to exist without killing each other. Walter is an ex-marine and CJ is a scientist. CJ’s grandfather is a well respected scientist. His personal lab has always intrigued CJ because of the weird bones he worked on. One secret trip to the lab revealed a body of a member of the Nightshade Group. What had her grandfather done and why is the body in his lab? Now the trial under fire begins. CJ and Walter are pulled out of training and sent to a small town in the Ozarks. Some group of rebels are killing people in that area. They are on their own without the help of a seasoned agent. They are literally fighting for their lives. As the evidence starts to pile up, it becomes clear that a person very close to CJ is responsible. Will she be able to do her job and bring the guilty person to justice? As always, I thoroughly enjoyed the book. It is definitely a page-turner. Highly recommend it. 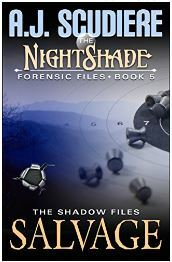 This is the fifth book in the Nightshade Series. I recommend you read all five. AJ is an excellent writer and keep readers in suspense from page one to the end. One book and you will be a fan for live. Can’t wait for AJ’s next book to come out.